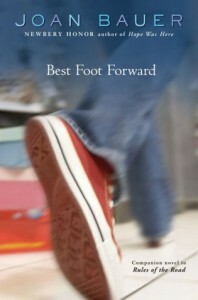 When I first saw Best Foot Forward at the used bookstore, I admit that I had mixed feelings. Especially when I found out that it was a companion to Rules of the Road which just so happens to one of my most beloved books. But on the other hand I was excited to get a chance to reconnect and hear more about Jenna, Mrs. Gladstone and the rest of the characters. I am happy to let you know that Best Foot Forward was just as good as I hoped it would be and will definitely be making my must re-read list (at some point). But what really makes Best Foot Forward (and Rules of the Road) a must read would have to be Jenna, the main character. I like her because her personality is so real. It's also nice to read a book that features a pretty leval headed character whose story you can just get caught up in. I honestly don't read that many contemporary books, but I have been lucky that the few I have chosen to read have been ones that I'd probably in all likelihood read many times, and Best foot Forward was definitely one of those. Okay, so my favoroite thing about Best Foot Forward would have to be that I got to read more about some of my favorite characters, Jenna and Mrs. Gladstone, along with the new cast additions. I loved how the new and old characters stories combined to make an unforgettable book. Final Verdict: One amazing read, with a strong, hard-working lead character that you can't help but root for. Joan bauer is one of my all-time favorite authors, so this will probably came as no big surprise. But I highly recommend giving Rules of the Road and Best Foot Forward (or any of her other books) a try. Best Foot Forward earns 5 out of 5 pineapples.